I've been a member of the Corvallis Society of Model Engineers for about 7 years now. Its been fun belonging to a group of great people who love to model trains, have years of knowledge and skills to share and are just fun to hang out with. Every year we hold our annual open house on Thanksgiving weekend and the following weekend. We average over 1000 visitor each year and collect about 2/3 of our annual budget for the next year from the entry fees. 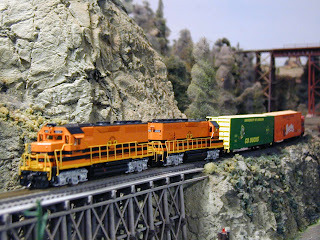 We are an HO scale (1/87th) club, the second largest in Oregon. In 2009 the club will be celebrating its 50th anniversary. That is a pretty impressive milestone for a model train club, or just about any sort of organization. I've had the priviledge of acting as president of the club twice, in 2005 and currently in 2008. Its been fun helping direct the activities and future of the club. With our upcoming move to Italy, I will be stepping down as president for 2009. I fully intend to find a model train club to join or visit in the Milan area. I hear there are 2 or 3.